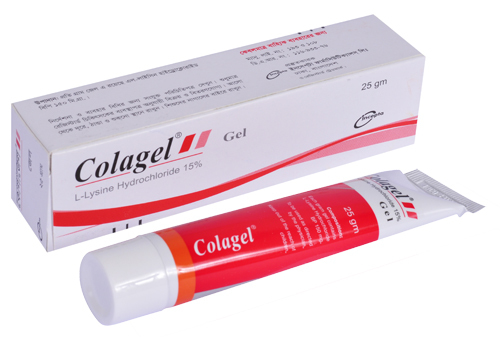 Colagel Gel: Each gram gel contains L-Lysine hydrochloride BP 150 mg.
L-Lysine hydrochloride is an essential amino acid, soluble in water; has been observed to promote in-situ cellular expansion in acute and chronic wound beds, in presence of blood plasma derived growth factor(s). This essential amino acid promotes healing of wounds by active and controlled regeneration of in-situ cells. It also protects the wounds against common organisms. For the treatment and prevention of infection in cuts, wounds abrasion, surgical incisions and burns. For the treatment of decubitus or stasis ulcers, advance chronic wounds, infected traumatic lesions etc. Gel may be used as often as required, preferably at an interval of 24, 48, 72 hrs. The affected areas should be cleaned with normal saline and/or surgically if necessary till the wound bed looks red/few bleeding points appear in the cleaned wound bed. Then gel should be applied liberally. The areas may be covered with a moist dressing and/or a bandage. Slight itching sensation might be there on application. In cases of discomfort on application, please consult with the physician.